Four and one-half feet by ten feet. 45 square feet. Until last summer, that was the size of the cells in the segregation unit at Illinois’ Menard prison–Illinois’ largest prison, housing over 3,000 men. There are no windows in these cells. The cell-fronts are not open bars, like you typically see on television: the cell-fronts are solid steel, broken up only by a small window so guards can see in, and a feeding slot which is kept locked. The beds are approximately 3 ½ feet wide. There is a toilet/sink at the back of each cell. That leaves a tiny rectangle about 1 foot wide, and 8 feet long of open floor space–not enough room to comfortably pace back and forth. These Menard segregation cells were too small. Illinois law requires that all new and remodeled cells provide at least 50 square feet per person. 730 ILCS 5/3-7-3(b). Last summer, the segregation cells at Menard were remodeled. But they were not remodeled to come into compliance with Illinois’ minimum standards. Instead, officials welded a second bunk above the original bed. Now, most of these tiny cells house two men. Not 50 square feet of floor space per man. Not 25 square feet. Four square feet of open floor space per man. There literally is not room for both men to stand up in a cell at the same time. Men are locked in these tiny cells virtually 24/7/ They may leave their cells for a quick shower (if they are lucky), and for four to five hours each week to go to yard (if it isn’t cancelled). That is it. Otherwise, they spend 24 hours a day, seven days a week, locked in this tiny space. At the end of 2013, Illinois prisons held over 2,000 men in its segregation units. In 2010, the Vera Institute determined that Illinois locks up far too many people in segregation, for far too long, for petty offenses. Vera concluded that Illinois’ excessive use of solitary did not make our prisons safer. http://www.courthousenews.com/2013/03/13/illprissegfoia.pdf. It does, however, do permanent damage to the men subjected to these deplorable conditions–the vast majority of whom will be coming home. 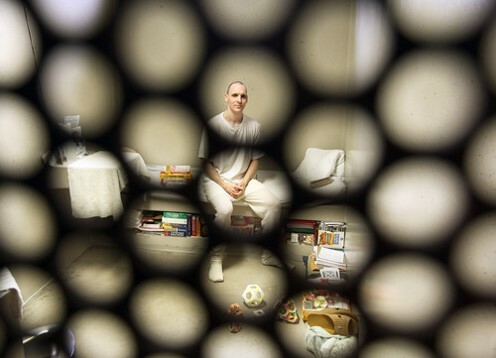 The United Nations Special Rapporteur on Torture, Juan Mendez, found that solitary confinement lasting more than 15 days constitutes torture, and should be banned under international standards https://www.un.org/News/Press/docs/2011/gashc4014.doc.htm). In Illinois, more than 350 people have been in segregation for more than a year. One man has spent over 14 years in segregation. On January 15th, 12 men in a special segregation unit at Menard Correctional Center, commonly referred to as the High Security Unit, initiated a hunger strike. While some of their grievances related to the physical conditions of solitary, their core demands were for basic fairness. They wanted to know what they were supposed to have done wrong to get put in solitary. They wanted an opportunity to defend themselves against those charges. They wanted to know what they could do while in solitary to earn additional privileges. Most importantly, they wanted to know how they could earn their way out of solitary. These are basic requisites of due process which are guaranteed by the United States Constitution. Westefer v. Snyder, 725 F. Supp. 2d 735 (S.D. Ill. 2010). The Department’s response? Prisoners are not entitled to due process! On February 15th, the men ended their hunger strike. Their physical conditions had improved, and officials promised that they were working on drafting rules and regulations governing solitary. We, the people of Illinois, must ensure they keep their word. We must demand that prisoners be given the basic requisites of due process before they can be subjected to these torturous conditions. We must work to close these units.